My father-in-law, Jim Stipovich (affectionately known as "Chief" within the family), is a photographer . So, for his birthday, when I was trying to think of a cool cookie to design for him, I got the idea to incorporate some of the film cameras he's used over the years. They are kinda "vintage cool & retro trendy" right now with all the instagramy effects and what not. 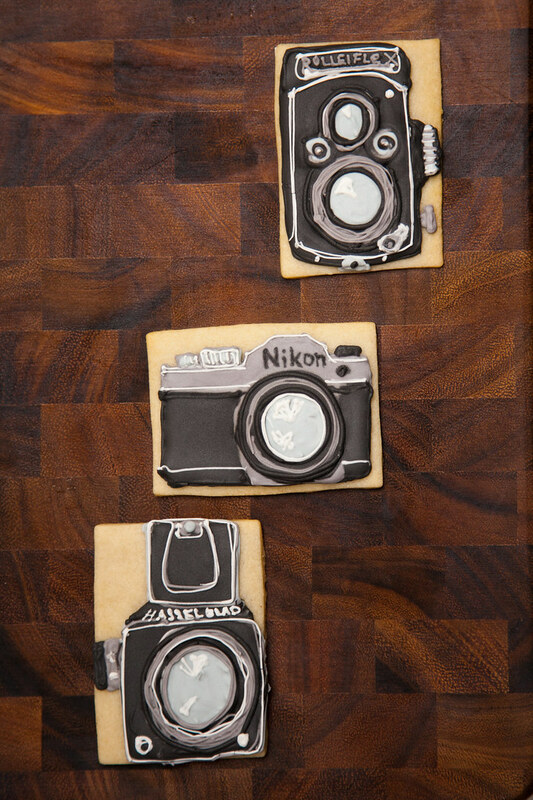 For Jim's birthday cookies, I chose three kinds of retro camera cookies: a Rolleiflex, Hasselblad, and a (generalized) Nikon F 35mm cookie. Kinda fun, huh? When trying to find photos of these cameras or images that would help me "simplify them" for cookie-decorating sake, I came across a few fun finds on Etsy that I used to help me in my design, like this clever Rollei print from Etched & Sketched. And this Hasselblad Kid's Hoodie from Film Monsters. Nikon Artwork Recycled Notebook from A Lost Feather. And finally, a picture of Jim in action (taken by Cole with a not film camera) with the Rollei shooting the champagne toast at Madie & Alex's wedding this past weekend! Go Chief!